If you find school challenging! This will give you lots of hope. We've been brainwashed with that our whole lives our parents believe that education is important. So they tell us that, we need to excel in our academics in order to get a diploma and that diploma is our ticket to high paying jobs. Simply put you have to be an "A" student to be successful in life. However according to Robert Kiyosaki author of why a student's work for "C" students and "B" students work for the government. It's really the other way around. It's a student that end up being employed by "C" students! We're as baffled as you are so we decided to investigate further. 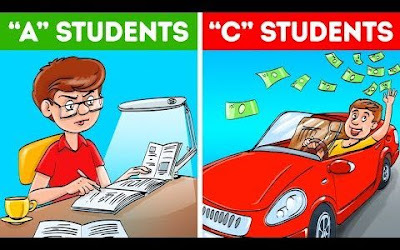 We found 8 reasons why "C" students are often more successful in life. #8 "C" students questioned the significance of the academic system. Yes, they still go to school but they don't blindly trust the educational system. They see it as a factory that produces obedient and compliant workers. "C" students don't want to be molded by that. They question why they need to find X in a math equation when all they want to know is how to earn money. "C" students are more interested in a straightforward approach and unfortunately for them academia doesn't offer that. They hack their way into the system by taking on odd jobs or learning outside of school. They're more sold on the Practical approach than the theoretical method and thanks to the Internet. It's now becoming even easier for "C" students to do it their own way. You can earn a degree or certificate based on your interests or passions through online courses at your own pace right in the comfort of your own home. You can even start your own business online while studying. #7 They're not afraid to fail or get bad grades. You know the saying if at first, you don't succeed pick yourself up and try again or something like that. Hey, this could match perfectly with "C" student mentality. Well, a student's aim for perfection on their first try "C" students aren't afraid to fail even several times. They embrace their shortcomings and learn from them. The problem with aiming for perfection from the get-go is that you're much more devastated when you fail. Instead of getting everything perfect at once. "C" students know they can improve what they're doing every time they fall short. They believe mistakes are the stepping stones to success and that experience is a great teacher. If "C" students can handle their mistakes easily then they possess a characteristic every entrepreneur must have. Which brings us to our next point. #6 "C" students are risk takers. For "C" students life isn't like a standardized test with a strict answer sheet. They treat life as a game with unexpected twists and turns and in the game of life you don't always have options A through D. Choose the correct alternative. "A" students like to play it safe to avoid failure. Yet "C" students who receive their fair share of F's in their academic life aren't afraid to leap into the unknown. They take calculated risks to figure out what they really want in life. Since they don't excel in academics "C" students find other ways to get ahead. A lot of them have experimented with different jobs to find out which one suits them best. A typical "A" student is more likely to finish school go on to college get a degree in some field an start working in that sphere as soon as they graduate. But how can they know that this particular job is their calling.? #5 They're not submissive followers. We've established the fact that "C" students don't fully trust the academic system. Since it basically teaches you to submissively regurgitate the answers that teachers expect of you. While this might be fine for "A" students since they want that teacher to give them the all-powerful A. "C" students tend to do the opposite. They are the unpredictable group that questions everything. They're not the yes group. They're more like the Yes-But team. Just look at what Mark Zuckerberg and Bill Gates did. They dropped out of college to pursue their own dreams. They didn't stay within the lines but blaze their own Trail instead. #4 "C" students have people skills. Another factor that differentiates a lot of "A" students from "C" students is that the C's tend to have better social skills. Besides experimenting in the workforce. They also devote themselves to building networks that can benefit them in the long run when they enter the real world. "A" students believe they've got everything they need and can perform any task efficiently on their own because they have validation from their report card. "C" students, however, admit they need help from those that are more skilled than them. This is why "C" students appreciate people and know how to treat them. When they interact with others they make sure the other party feels important in value. They have a certain charm that draws people toward them characteristics every leader should have. #3 They find simpler ways to get things done. "C" students tend to be lazy. They don't want to put much energy into accomplishing a task. They'd rather be investing their time and effort in pursuing their dream. This doesn't mean they procrastinate. Instead, they search for simpler and more effective solutions to a problem and their ways are often the most ingenious. They're more innovative than "A" students, who tend to go by the book. Bill Gates is a firm believer in this he said: "choose a lazy person to do a hard job because a lazy person will find an easy way to do it." #2 "C" students are dreamers. Teachers favored reprimanding phrase to "C" students is pay attention. They're always caught looking out the window and staring blankly into space. Sure they can listen to a lecture but they won't devote themselves to it. Why to see students minds wander so easily? They're more interested in thinking about what they want to do in life. Rather than being stuck in the four walls of a classroom. They already have a blueprint of their future after they graduate. #1 They have their own definition of success. important but they know there are other means to becoming successful outside the classroom. They pursue their ambitions by using unorthodox methods through part-time jobs, networking or self-study. "C" students possess skills that every entrepreneur should have they're risk-takers, dreamers, innovators, people persons and they're not afraid of failure. This is why "C" students make great bosses while "A" students become their employees. "C" students decide what they want done and a students are good at taking and following these instructions. In our digital age where almost everything is driven by technology. Getting good grades is taking the back burner while acquiring relevant skills is becoming more and more valuable. Sure employers still do consider if you have a degree but they're not concerned if you did it with flying colors or not. That's an added bonus yes but what they're looking for is work experience you've gathered through the years and the skills you've acquired from doing so. LinkedIn CEO Jeff whiner hit the nail on the head when he put it simply "skills not degrees." The things you've learned in school or college aren't always transferable in real life. Will you find a job by finding X and that's why "C" students are often more successful than eight students. there that don't become hugely successful entrepreneurs. At the same time, plenty of "A" students do find success in life. your goals and make your dreams come true. So what about you? Are or were you a C student a straight-a student or somewhere in between? Now, do you agree with the points discussed in this article let us know in the comments below. Don't forget to give this article a share if you found it useful and send it to all your friends and do subscribe to our Blog.